Most "ray tracers" these days are what we used to call "path tracers" or "Monte Carlo ray tracers". Because they all have about the same core architecture, this short hand is taking over. That "sample_color()" does whatever it does to sample a font or whatever. The first thing that bites you is the diminishing return associated with Monte Carlo methods: error = constant / sqrt(num_samples). So to halve the error we need 4X the samples. It's regular and uniform, but not too regular. 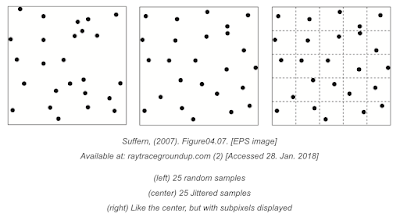 So you sample a nine dimensional hypercube randomly and map those nine-dimensional points to ray paths. Really this happens in some procedural recursive process, but abstractly it's a mapping. This means we run into the CURSE OF DIMENSIONALITY. Once the integral is high dimensional, if the integrand is complex, STRATIFIED SAMPLING DOESN'T HELP. However, you will notice (almost?) all serious production ray tracers do add stratified sampling. Why? What does matter is the diffuse bounce. So it acts like a 2D problem. So we need the BRDF samples, let's call them u7 and u8, to be well stratified. Create a 4D pattern using the permutation where the ith sample is light1[i], light2[i],pixel[permute[i]], pixel2[permute[i]]. 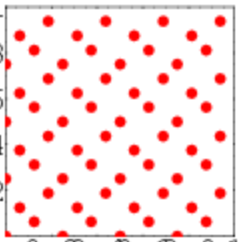 So a pain :) There are bunches of papers on doing Monte Carlo, QMC, or "blue noise" uniform random point sets. But we are yet quite done. First, we don't know how many dimensions we have! The program recurses and dies by hitting a dark surface, exiting the scene, or Russian Roulette. Most programs degenerate to pure random after a few bounces to make it so we can sort of know the dimensionality. Second, we might want a progressive preview on the renderer where it gets better as you wait. Here's a nice example. I need to stick a " ideal thin lens" in my ray tracer. Rather than a real lens with some material, coating, and shape, it's an idealized version like we get in Physics1. So what is point b? b = a + (c-a) (B+A) / A? So what is (B+A) /A? OK lets try a couple of trivial cases. What if A = 2f? For some tests you want the set of "all" rays that hit a box. If you want to stratify this is somewhat involved (and I don't know that I have done it nor seen it). 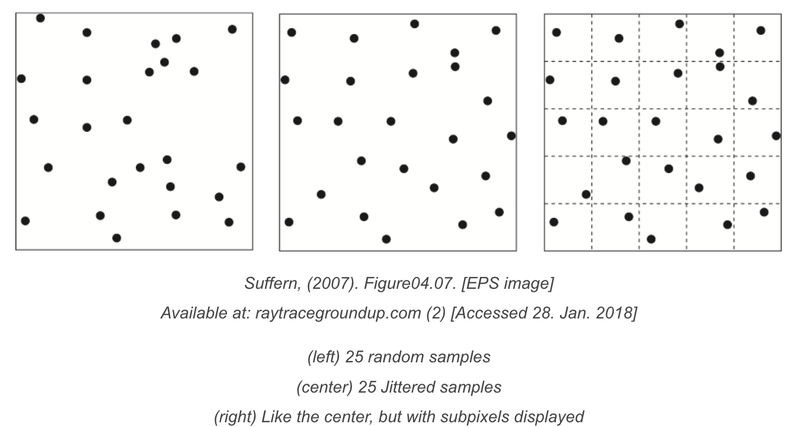 Chris Wyman and I did a jcgt paper on doing this stratified in a square in 2D. But often stratification isn't needed. When in doubt I never do it-- the software is always easier to deal with un-stratified, and as soon as dimension gets high most people dont bother because of the Curse of Dimensionality. Now candidate is the index to the side. Now we have a ray origin. What is the ray direction? It is not uniform in all directions. These are the rays that hit the side. So the density is proportional to the cosine to the normal-- so they are Lambertian! This is not obvious. I will punt on justifying that for now. Now we need that for each of the six sides. 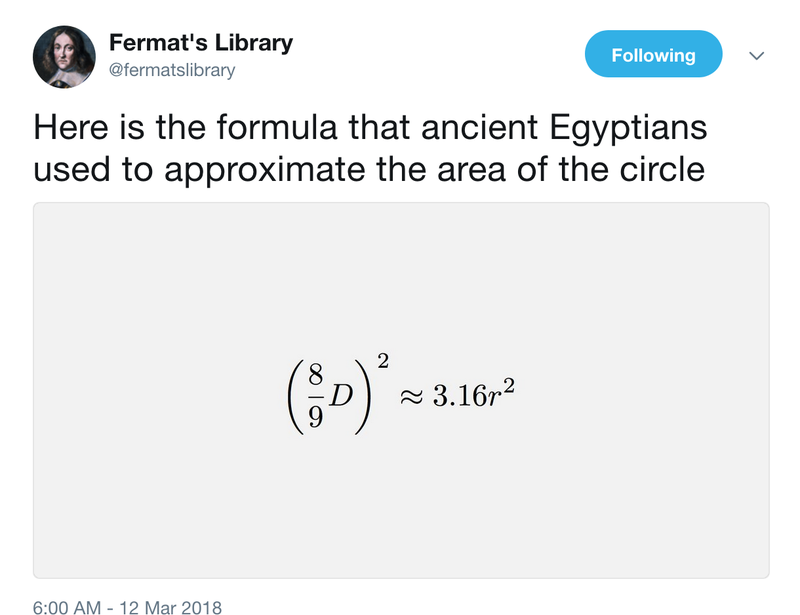 I saw a neat tweet on how the estimate the Egyptians used for PI. This is all my speculation, and maybe a math history buff can enlighten me, but the D^2 dependence they should discover pretty naturally. Including the constant before squaring is, I would argue, just as natural as having it outside the parentheses, so let's go with that for now. So was there a nearby better fraction? 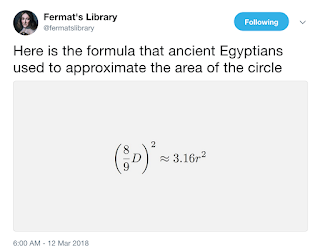 How well did the Egyptians do? A brute force program should tell us. So 7/8 was already pretty good, and you need to get to 23/26 before you do any better! I'd say the Egyptians did extremely well. So 7/9 is not bad! And 11/14 even better. So no clear winner here on whether the rational constant should be inside the parens or not.